Posted By: Godot Date: 7/11/13 4:34 a.m.
Yessss... the platform sound is back! But both doors don't actually physically have to close. I noticed this glitch at the left-hand door. When I attempted to close the door before the Wasps got through they got stuck on top, the platform stopped and the crushing sound went into a loop. See pic below. 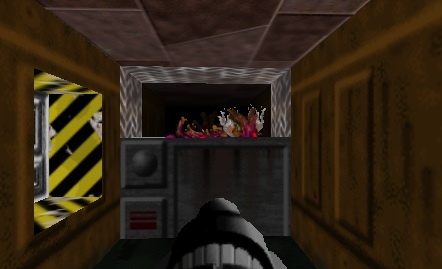 In the original game, the platform would have squashed the Wasps and closed completely.